Your union is always seeking to improve workplace conditions and serve the interests of its hardworking members. 401 members make this great union what it is and without members fighting hard over many years to make improvements their Collective Agreements, including job security provisions, wages, and health benefits, we would not be the leaders we are in the labour movement. Our nearly 27,000 members have worked hard to bring improvements to their workplaces so that others can benefit as well. 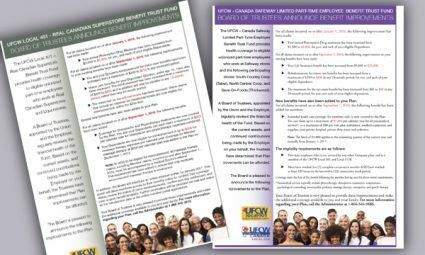 UFCW 401 negotiators, along with the dynamic members who make up the negotiating committees, have been able to bargain industry leading health and welfare benefits for both full-time and part-time workers in many workplaces. Among them, Safeway-Sobeys and Superstore have some of the best benefit plans in the retail food industry, including those for part-time workers, which is rare in retail. Recently, significant improvements have been made to these 100% employer paid benefit plans. In order to take full advantage of what you are entitled to under these plans, we urge you to check them out. And if you have any questions whatsoever, please don’t hesitate to contact your Union Rep or your Shop Steward in your store.